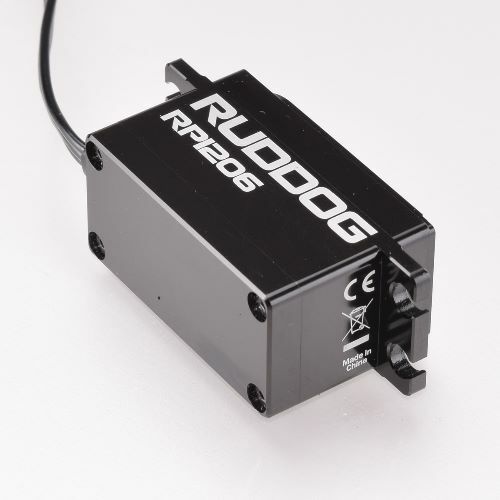 The RUDDOG RP1206 Coreless Low Profile Servo was especially developed for the needs of 1/10 vehicles. It is the perfect fit for offroad and onroad and offers not only the necessary power and speed for high demanding competition cars, but also the perfect looks for it. 0.07sec speed and 10kg torque at 6.0 Volts, aswell as 0.06sec and 12kg at 7.4 Volts will give you enough power and speed under all circumstances. The servo case is fully made of aluminium and high-class anodized and laser edged. We even took care that the mandatory legal notes (CE and WEEE) are at the right spot hidden behind your servo mount. Furthermore the servo features a all-black wire and is available in two version with 8cm(RP-0080) and 18cm(RP-0081) wire length. So you can choose the perfect length for your car. Please note that there are no accessories included with the servo as those are not neccessary for most 1/10 cars. Please use the servo horn included with your kit. All RUDDOG servos are designed to use a 25T spline like Futaba or Savöx.